In June 2017, the voluntary standard NZS8510 was released referencing testing and decontamination standards for methamphetamine contaminated property in New Zealand. It is worth noting the levels referenced standard NZS8510 relate to a total amount of methamphetamine, measured in micrograms (µg), collected from a specific sample size of 100cm². In Australia, the acceptable post decontamination level for methamphetamine is 0.5 100cm². In the USA, levels vary from State to State and range from 0.05µg to 1.5µg/100cm² with most States adopting a level of either 0.1 or 0.5µg/100cm². Is the level in standard NZS8510 safe? The levels in standard NZS8510 suggest that most people will suffer no adverse health effects from exposure at or below the referenced levels. Ultimately, each person must decide for themselves what an acceptable level of methamphetamine residue is within a property. 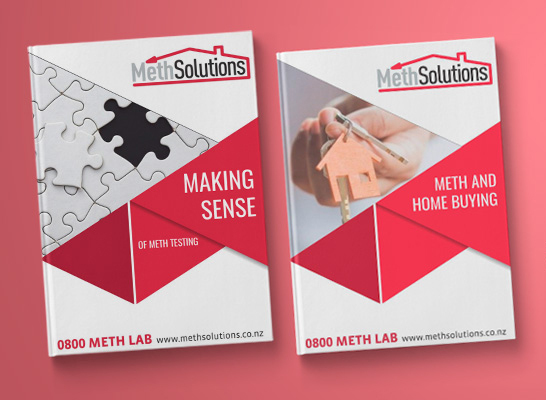 When set alongside the view of the Auckland Regional Public Health Service (ARPHS), that “no decontamination procedure can guarantee absolute safety.” it is unclear what can be considered a truly ‘safe’ level of meth residues in a property. Indeed, given the history of ‘safe’ levels of chemical contaminants being revised over time, it is understandable why uncertainty remains for many. It is to be hoped the New Zealand Government invests more into independent research that provides clarity. If this clarification is available, the advice that is provided by private companies working with members of the public will not need to be qualified in the same way it is today. The standard NZS8510 is effectively a benchmark against which to assess methamphetamine test results. MethSolutions Baseline Infield Composite sampling method is currently being validated by ESR to be used as a screening assessment. Detailed assessment to determine the degree of methamphetamine contamination by taking discrete individual area by area samples of 100cm² . Samples must be taken using a NIOSH method with lab analysis of the samples. MethSolutions discrete individual area by area sampling method is approved under the standard for a detailed assessment. Post decontamination assessment sampling and assessment to confirm the efficacy of decontamination and ensure methamphetamine residue in all areas meet the limits in the standard. MethSolutions investigation unit, CPINZ, uses the discrete individual area by area sampling method approved in the standard. Results will be an indication only if the testing or sampling method used is not carried out in accordance with the standard or alternatively validated as an approved method. Where discrete individual area by area surface wipes are taken interpreting the results against the standard is straightforward. If the level of methamphetamine in any one individual sample exceeds 1.5/100cm² in an area considered to be high use, the limit prescribed in the standard is exceeded. Where Baseline composite samples are taken or in-field test kits used, interpreting results is more challenging. Our Baseline Infield Composite method of sampling is currently undergoing validation with ESR. This type of test will then meet the Standard as an approved sampling method for a screening assessment. This method of sampling is fit for pre-purchase due diligence and we use one test kit to take up to 8 surface wipes which are analysed as one composite sample. This allows meaningful relativity to be established between the acceptable levels in the standard and the total cumulative amount of methamphetamine residues found in the composite sample. Surface samples should be taken in multiples of 100cm² if any sense of relationship to the standard is to be established. The total amount of methamphetamine present in a composite sample gives an indication only as to the extent of meth related behaviour that has occurred in the areas sampled. The higher the level of methamphetamine residues, the greater the likelihood of manufacture having occurred. Where the total amount of methamphetamine present is below 1.5µg as a composite total, the likelihood of methamphetamine being present at levels above the standard reduces. Assuming methamphetamine is even present in a property, there are many different factors affecting the amount of methamphetamine that can be picked up in a sample i.e. ; the recovery rate. Taking samples for methamphetamine residues is not overly complex. However, there are some things people need to be aware of and with some basic training, good disciplines, great attitude and most importantly the right type of test kit, it is possible for people without university degrees and formal training in forensic science to do an effective job of sampling property. Experience helps. Most people using individual sampling kits that are analysed in a lab, will know to sample those areas which are likely to provide the best yield of methamphetamine residues if they are present and to be disciplined in the size of area they sample i.e. : 100cm². All MethSolutions Certified Samplers undergo training with us and receive regular training updates, annual refresher sessions and are subject to quality assurance checks. A hard, dirty, non-porous surface, will yield good amounts of methamphetamine, if it is present. Soft furnishings or untreated timber and wood can retain large amounts of methamphetamine, but yield very little when it comes to a methamphetamine test. The acceptable levels referenced in the standard is based around a discrete area by area sample of 100cm². If 1.5µg of methamphetamine residue is recovered in a single sample size of 100cm², the levels in the standard have been breached. However, if 1.5µg of methamphetamine has been recovered from a single sample of 400cm², then it is below the levels referenced in the standard. Where multiple sites of 100cm² have been sampled, as is done with infield composite sampling, and 1.5µg of methamphetamine is recovered, then, unless all samples are from the same room and on similar surfaces, only an indicative relationship to the standard can be made. If all methamphetamine is in one area sampled, that area is above the levels referenced in the standard. If it is evenly spread across three or more samples, it is below the levels in the standard. The only way to be sure, is for discrete individual area by area samples to be taken. However, if no methamphetamine is present, then you do not need to go to the expense of discrete individual samples! Assuming there is discipline to sample an area of 100 cm², a key influencing factor to the recovery rate (beyond the surface from which samples are taken) is how effectively the sampler covers 100cm2. Lab based sampling kits make it relatively easy to effectively sample the full 100 cm². A cotton gauze swab, soaked in methanol, is wiped across the surface. Some instant answer infield kits use a swab-like approach while others use cotton buds. This can make sampling the full 100cm² more challenging and reduces the recovery rate of methamphetamine from the surface. Regardless of which approach is adopted, if the full 100 cm² area is not sampled, the methamphetamine which is recovered, while presented as coming from 100 cm², is in fact from a smaller area. This means problematic levels of methamphetamine residues can be missed! If cleaning has occurred, particularly if newly available chemical decontamination sprays are applied in insufficient quantities, surface levels may be below the levels referenced in the standard. However, just below the surface the level of methamphetamine may be well above the levels in the standard. So, if the property returns a result of no detectable meth, it may not be health and safety clean. The problem has not been properly addressed and people will still get sick. Identifying methamphetamine residue is done by sampling surfaces. If the property has been recently renovated, the surfaces that are available to be sampled are likely to freshly painted. This can seriously compromise the integrity of the surface sample. It is likely less than ideal sampling sites are selected and it means the presence of any methamphetamine at all, needs to be treated with caution. ‘What lies behind the paint?’ is a question which absolutely should be asked. The key thing to remember, is that no matter what surface is sampled, outside of laboratory conditions on perfect sampling surfaces, even the very best and most experienced forensic scientist will NEVER recover 100% of the meth that is present on a surface. So, any reading for the presence of meth residues, should be looked upon as a minimum.